Anthem Statement D2v/P5 review | What Hi-Fi? Unlike some ultra posh kit, Anthem's Statement processor-and-power-amp combination is far from stylish; if you think differently, we'd be interested to see what your front room looks like. But that doesn't matter a jot once you've given it a listen. It might be laughably expensive (and insanely heavy), but the Statement is something very special. In fact, it's probably the best we've ever heard – and in a class where brands such as Krell, Lexicon and Meridian lurk, that's saying something. Let's talk muscle. The 'basic' 5.1 system here gives you a single P5 power amp, a five-channel, 59kg leviathan rated at an epic 325W each, rising to a scary 500W per channel into 4-ohm speakers. 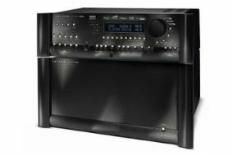 If you want an extra two channels of power for a 7.1 system, you can add an additional P2 power amp, which brings another 1000w of power to the party: just add £3850 to the bill. Now that you've got enough power to put your sofa in orbit, what about the brain side of things? That's the job of the D2v processor: unlike most high-end kit, it packs in every conceivable input, decoding mode and video-upscaling option imaginable, all the better to maximise the potential of its hulking power-amplifier partners. OK, so the on-screen display is no rival for the user interfaces found on the likes of Denon's AVP-A1HD, and yes, its fascia does look like someone threw a box of silver buttons at a black metal slab to see what would happen, but what the hell: it works, and it allows lots of tweaking. So much for the build-up: what about the sound? Two words: 'chuffing' and 'brilliant'. The Anthem takes your room apart, shifting walls and ceilings to create a broad sonic vista as spacious and atmospheric as the biggest cinema. And is it ever powerful: The Dark Knight's oft-used Batpod chase sequence had several testers awestruck, so spacious and powerfully rendered was its soundfield. The dramatic firefights in Band of Brothers are just as striking, as forceful a presence in the room as we'd ever consider comfortable. But it's not all about force. The subtle steering effects in 3:10 to Yuma come over beautifully, while the multichannel Blu-ray of Marcus Miller's The Panther had one guitarist on the team enthralled by its live acoustic and dynamics. It even delivers the goods in stereo. This much money ought to ensure results, but that's not always how things work out. Anthem, however, has delivered what it ought. Statement? Yup, and it's a brief one: 'world-class'.